By PHIL BOX| Rock … rock … rock! Those are the scariest words any belayer ever wants to hear … I am looking up after hearing those dreaded words and can see momentarily a block heading towards me, looming larger and larger with every nanosecond’s passing. This was on a climbing road trip, visiting various crags around Tasmania. The team consisted of Lee, Jono, Ken, Neil, Rob, Kathy and myself. First up, Hillwood not far from Launceston, remnant of a long extinct volcano. There are a lot of single pitch sport routes on the tessellated patterned walls of this amazing area. The lava has cooled to form geodesic patterns on the rock that are perfect for steep crimpy climbing. We had all of our limited Queensland tropical cool weather gear on, and we still froze. Next destination: Ben Lomond, over 1500m above sea level. The Ben is famous for its 2- and 3-pitch soaring crack lines. 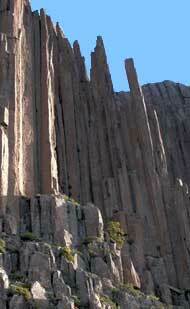 We were not disappointed as we gazed up on the marching diorite columns. However, this is where we experienced the coldest weather on the trip. We had all of our limited Queensland tropical cool weather gear on, and we still froze. At 6pm, Lee was shivering while wearing the sum total of his clothes for the trip: three thermals, a T-shirt, a light Polartec 100 jumper, and cotton three-quarter pants. I am afraid that coming from the subtropics we simply are not prepared for cold weather. The next day while we waited for the air to warm up, we drove up to the ski village at the summit, awestruck by the road carving its serpentine way up through an incredibly steep scree slope. One reason for the drive up was to show me snow for the first time — although all we saw was some white shadecloth. Back down the incredibly steep scree slope we geared up to do the 40-minute boulder hop mission back to Frew’s Flutes (the main crag) on the Ben. The quality of the rock on Ben Lomond is superb, with awesome friction. The cracks are not straight splitters; rather, when you place your hand within the crack, you find that the crack wends its way to form a sinuous crack that is perfect for hand jamming. Our next stop: Coles Bay, which boasts some outstanding hard granite sea cliffs. 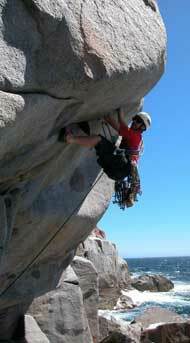 This location has easy traditional and hard sport, so there is something for most climbers. 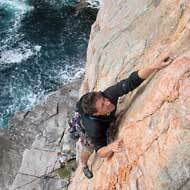 The surging ocean heaves itself up on the low rock platforms to threaten the belayer on some of the climbs. I received multiple drenchings on one climb whilst belaying Lee. The cold Southern Ocean makes for a very uncomfortable belay when it surges up around one's knees and splashes up one’s back, and sometimes right the way up to lick one’s helmet. Marten joined us now, and we all trudged down to The Hazards, a chain of weathered granite domes. Route finding was a little problematic at first, and Neil was the first among our number to launch up a climb. From all the pathetic whimpering we heard while he was on what should have been an easy climb, we decided to explore some other area, and went searching for The Underworld. The Underworld is a sea level cave that was formed by waves crashing up into the bowels of the earth. The cave is fully 20m deep and there are a couple of routes that climb up and around the mouth of this cave. 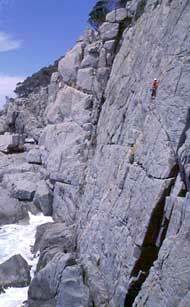 We were fortunate that in all the days we were in Tasmania the swell of the ocean was slight, or we may have had to curtail some of our climbing otherwise.